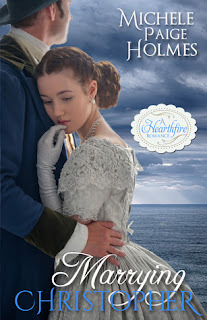 From Amazon Top 100 Regency Romance author, Michele Paige Holmes, comes MARRYING CHRISTOPHER, a regency romance from the Hearthfire Romance series. 5 out 5 stars. Loved it! When Christopher Thatcher boards a new steamship Amanda May on his quest for a new life, he doesn’t anticipate danger and romance finding him. He’s determined to leave behind all the sins of his father’s name and make himself a new life in the promise of America’s distant shores. His eagerness also stems from a desire to be free from the responsibility he’s felt all his life to tend to his sisters at the expense of his own needs and wants. He’s determined to not be caught in any pretty female’s trap for a long, long time. But when Miss Marsali Abbott, a woman bound for the life of an indentured servant in America, steps on board in great distress, he can’t stop old habits. Her quick wit and smile definitely don’t help his cause to stay aloof. But her need might be one that will cost him too much of his freedom. I liked the dialogue between Christopher and Marsali. They balance each other well and a couple of their exchanges made me laugh in their united quest to endure the other two passages on the trip. Marsali’s giving nature was backed by enough inner strength to make her neither martyr nor victim. Her past is riddled with dark memories, even her trip to the ship was full of danger, but she cheerfully faces things with a strong determination that helps her survive. The fact that Christopher also had a rough history made it so the characters could empathize with each other rather than one coming across as strong and the other in need of constant rescue. I rather enjoyed the departure from the normal rich man takes pity on less fortunate female story. Though that is in there to some degree, but I like how Marsali chooses happiness over fortune in the end. Also, I loved the look of this digital book. Sometimes reading a book on an e-reader lacks the visual appeal of the physical book, but the chapter script and format were beautiful. Just a quick warning, this is the third book in a series. I had read the first, but not the second so I could follow who the characters were in the beginning. However, there is mention of a pirate causing trouble for the family that left me a bit confused. Since it does play a crucial role to what happens to Christopher and Marsali it might me a good idea to read Loving Helen, the book before this one. I know I plan to go back and read it. Not just to fill in the gaps, but so I can enjoy another book about this intriguing family who found a way to overcome adversity and be better for it. Paperback version will be available August 30th on Amazon. Kindle version can be found here. Get Fourteen Books for only .99!